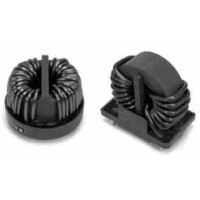 Nanocrystalline VITROPERM: This is the ideal basis for highest inductance with a low number of turns in extremely compact component volume. VITROPERM chokes are a universal solution for various EMI problems due to the excellent high frequency properties and the stable performance over a wide temperature range. All below listed standard types in low profile constructions are not moulded and designed for operation in grid connected RFI filters or for applications with higher operating voltages.